Working at heights always comes with risks. Falls continue to be the leading cause of death in the construction industry. They’re also one of OSHA’s top 10 most serious safety violations. OSHA usually requires a fall protection system, like a harness and lanyard, anytime a fall of six feet or more is possible. But that leaves the question, “Do you need a harness on a scissor lift?” The debate about when to use a fall protection harness on scissor lifts has been around for a while. Chances are it isn’t going away anytime soon. Scissor lift operators are often caught in the middle between safety and efficiency. Many wonder if they really need a harness in a scissor lift. Some say yes to be safe. Others say it’s not necessary. So which is it? Scissor lift harnesses don’t prevent falls. Their job is to arrest a fall when it occurs. They’re also designed to limit the forces on the body when a fall is arrested. They do this by using a system of straps and buckles to distribute the forces to the parts of the body that can best absorb them. These include the large muscles in the upper thighs, chest and shoulders, and the bony mass of the pelvis. This diverts the forces from more vulnerable areas such as the stomach, neck and groin. Harnesses also help workers stay upright during a fall. This allows the deceleration device to properly deploy. It also keeps the spine vertical so it can better absorb the forces of the fall. However, this cuts off circulation to parts of the body and can cause blood to pool in the legs. Safety personnel should have a plan in place to bring the worker to the ground as quickly as possible. Do You Need a Harness on a Scissor Lift? – Safety First.Employers and workers want to adhere to safety regulations. They also want to prevent accidents. – Having scissor lift workers wear a personal fall restraint system (PFRS) is cumbersome and inefficient. It can interfere with their work. And it may not be necessary. So, do you need a harness in a scissor lift? The answer depends on local safety standards and job site requirements. To help understand scissor lift harness guidelines, let’s look at OSHA’s fall protection standards for aerial work platforms. First, we’ll see how fall protection requirements for aerial lift workers impact certain industries. Next, we’ll look at fall protection requirements from OSHA’s point of view. We’ll also review local and site-specific regulations. And we’ll see how they affect fall protection and PFRS safety standards for scissor lift workers. OSHA provides guidelines for aerial lift platform (AWP) workers in general. They also have more detailed guidelines for the construction industry. Their Fall Protection Construction Standards and Resources lay out a detailed set of rules for construction workers that use aerial lifts. But scissor lifts aren’t considered aerial lifts because the work platform for a scissor lift doesn’t extend beyond the wheelbase. Instead, scissor lifts are considered scaffolding. This gives workers more flexibility than other aerial lift operators. Plus, most scissor lifts don’t extend as high as AWPs. Therefore, fall protection requirements aren’t needed. That doesn’t mean you shouldn’t use a scissor lift harness while working on a scissor lift. In fact, there are certain instances that require this type of safety tool. While OSHA does not require scissor lift workers to wear a harness or other PFRS, that doesn’t mean you shouldn’t. After all, there are many hazards associated with scissor lift use. That’s one reason OSHA requires scissor lifts to have guardrail systems. A guardrail is one of the most important types of scissor lift fall protection. Operators should always make sure that some type of guardrail is available before going up in the lift. If it isn’t, notify your supervisor right away. The lack of a guardrail makes accidents and injuries more likely. – Ensure a guardrail system is in place and stable before working. – Position the scissor lift to avoid overreaching away from the work platform. – Always stand on the work platform, not the guardrails. – Keep a firm stance with both feet on the platform floor. Those are OSHA’s basic rules for scissor lift fall protection. However, some job site rules might require the use of a PFRS or scissor lift harness. If you are required to wear one for any type of scissor lift operation, abide by the local laws and regulations. OSHA doesn’t make “blanket” guidelines for scissor lift workers. But failing to adhere to on-site safety rules can still result in penalties and fines. 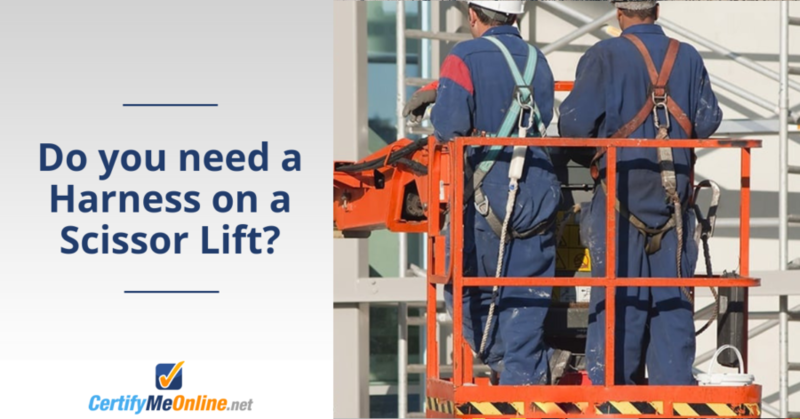 When Do You Need a Harness in a Scissor Lift? If there’s an adequate guardrail system, scissor lift workers don’t need a harness. However, if the guardrail system is lacking, additional fall protection is needed. Workers must have one or the other for scissor lift fall protection. If you have access to a guardrail system and wear a harness, that’s great. It’s always better to go the extra mile with your scissor lift fall protection measures. If a scissor lift comes with attachment points, contact the manufacturer for when and how to use the tie-off points. Is a Scissor Lift Harness Ever Unsafe? When wearing a scissor lift harness or lanyard, it’s important to know how to use them properly. If a worker falls out of the scissor lift platform, the force from the fall and reaching the end of the lanyard could cause the lift to tip over. The lanyard could also cause the worker to swing back and make contact with the lift. Wearing a scissor lift harness is usually a safe bet. Still, workers should only use a harness and lanyard that is made for the scissor or aerial lift they’re working on. It should also be connected to the correct attachment points. Sign Up for Fall Protection Training Today to Become an Expert! – Affordable pricing. Our coursework is affordably priced, so you don’t have to worry about blowing your entire safety budget on scissor lift or aerial lift training. – Aerial lift and scissor lift fall protection training. Learn about unique on the job situations that would require scissor lift fall protection equipment. Our classes also cover advanced safety techniques and much more. They are ideal for rookie aerial lift operators, veteran scissor lift workers, and everyone in between. – A flexible learning environment. Your workers can take their scissor lift training whenever – and wherever – they want. Plus, our learning pace ensures every employee from rookies to veteran aerial lift workers can grasp the training content. – 3-year renewal training. OSHA’s 1926.454 Subpart L, states that workers should require renewal training they lacks the skills or knowledge to perform basic scissor or aerial lift operation. Just to be safe, we recommend renewing your workers’ training certification every three years. All CMO classes have 3-year renewal compatibility. If your workers need aerial lift or scissor lift training, look no further than CertifyMeOnline.net. Our training classes are the best way to ensure all of your workers understand OSHA guidelines for safe operation. Sign up for our complete aerial lift training and scissor lift certification today. Within a matter of minutes, you can start the certification process for any of your workers – or all of them! To connect with our scissor lift and aerial lift platform training experts today, please call us directly at (602) 277-0615. Or view our prices and courses to select your required training. Fall protection training is one of the most talked about aspects of aerial and scissor lift operation. It’s also one of the most confusing. That’s why we created this all-in-one fall protection knowledge base. Here, you’ll find all you need to know about aerial lift and scissor lift fall protection. This page covers all sorts of crucial information. Topics range from the dangers of aerial and scissor lifts to OSHA fall protection regulations, We also review OSHA fall protection training, which benefits employers and workers looking to increase safety awareness on the job. Visit our aerial lift and scissor lift fall protection page today. There you will learn more about when and why fall protection equipment is required. You’ll learn the common types of lift accidents and why scissor lift fall protection is important. Most important, you will learn techniques to reduce or eliminate falls. This post was originally published in 2018 and has been updated as of 2019 to provide more in-depth information. This entry was posted in Scissor Lift Training and tagged OSHA, scissor lift, Scissor Lift Harness on October 5, 2017 by admin.